Over the past few days, candidates and their supporters have been scrambling to get your vote. You’ve gotten their mailers. They’ve knocked on your doors. It’s almost over – for now. Our Jesse Marx joined some nervous campaign volunteers in the 49th Congressional District over the weekend to document the last-minute get out of the vote efforts in a race where 16 candidates are vying to replace outgoing Republican Rep. Darrell Issa. This race has made national news amid fears that Democrats could block themselves from the November ballot since the top two vote-getters proceed to the general election regardless of party. Still need to do some cramming before you head to the polls? We put together a guide to major local races and recorded a special podcast to help you get up to speed. If you want to dive into the details, read the Union-Tribune editorial board’s extensive interviews with candidates and list of endorsements. 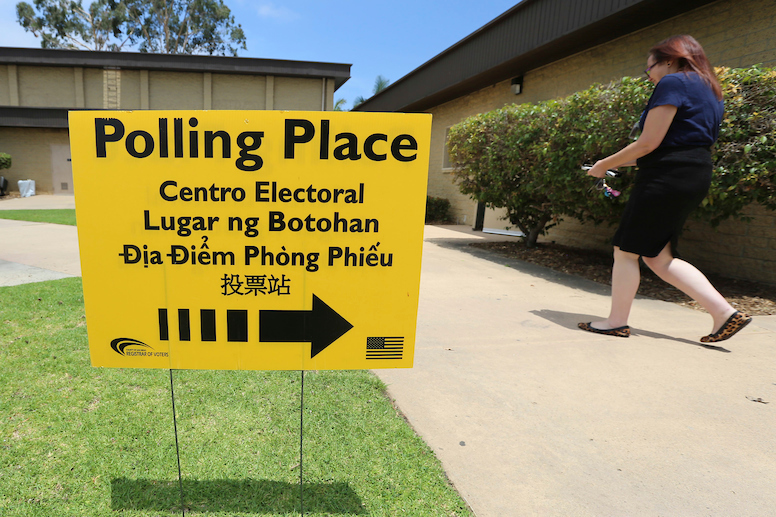 This KPBS tool allows you to type in your address and read up on all the races on your ballot, and this handy county site helps you find your polling place. CALMatters assembled a helpful guide to state races. Longtime Sen. Dianne Feinstein faces a progressive challenger in San Diego native Kevin de Leon but The Washington Post reports that she appears poised for a big win. KPBS looks into a claim dominating the county assessor’s race: that challenger Matt Strabone, who hopes to unseat longtime Assessor Ernie Dronenburg, can deliver tax breaks for 150,000 homeowners countywide. We enjoy an Election Day tradition here at VOSD. We ask readers to make predictions on a handful of races and reward the winner with a lunch with VOSD CEO Scott Lewis, Managing Editor Sara Libby and Assistant Editor Andrew Keatts. Send your responses to scott@voiceofsandiego.org to each of these questions and we’ll report who won in next week’s Politics Report. District Attorney: Pick over or under: Summer Stephan, 53 percent. 49th Congressional District: Pick over or under: Doug Applegate, 13.5 percent. 49th Congressional District: Pick both candidates to make the runoff. County Supervisor District 4: Pick over or under: Bonnie Dumanis, 37.5 percent. County Supervisor District 4: If there is a runoff, which Democrat (or Democrats) will make it? Ken Malbrough, Lori Saldaña, Nathan Fletcher or Omar Passons? Sheriff: Pick over or under: Bill Gore, 55 percent. County Assessor-Recorder-County Clerk: Pick over or under: Ernest Dronenburg, 53.5 percent. San Diego City Council District 2: Pick over or under: Lorie Zapf, 46.5 percent. San Diego City Council District 8: Rank how these three candidates will end up: Antonio Martinez, Vivian Moreno, Christian Ramirez. Chula Vista Sales Tax: Pick over or under: Yes, 47.5 percent. Tie Breaker: What percent of the vote will Rocky Chavez get in the 49th Congressional District? There’s been a lot of interest in and breathless coverage of two similar but separate stories involving children and the border that keep getting conflated. In the latest Border Report, Maya Srikrishnan breaks down both issues: the outrage over 1,475 “lost” unaccompanied minors who crossed the border, and the parents and children who are being separated at the border by U.S. officials. Former Tijuana Mayor Carlos Bustamante Anchondo is on a mission to make his city an air cargo hub. (Union-Tribune) We’ve previously reported on Tijuana’s hopes to build an air cargo facility near its airport and what that could mean for San Diego. The Washington Post is out with a big feature about President Trump’s claims about San Diego’s border. In a wrongful termination lawsuit, the former head of the city of San Diego’s public records department said the city unfairly fired her for releasing public records related to how city officials handled last year’s Hepatitis A outbreak. In Lea Fields-Bernard’s claim, she said she was fired just weeks after her department released documents in response to public records requests by Voice of San Diego and the San Diego Union-Tribune, NBC 7 reports. 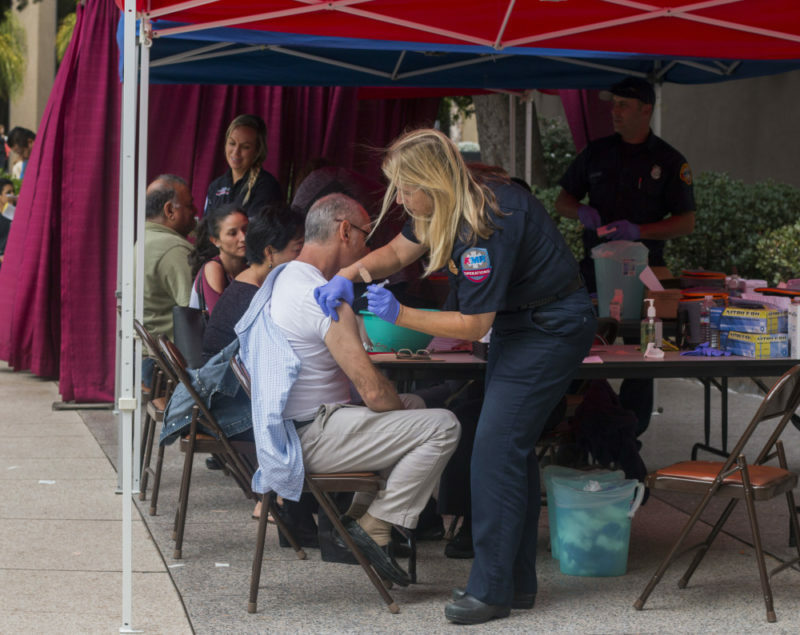 Voice of San Diego used those documents to write this story, which shows how county and city officials exchanged sporadic, cordial emails about the hepatitis A outbreak for months before finally springing into action. That San Diego has a housing crisis is now a foregone conclusion among local leaders. But in a new op-ed, Point Loma resident Russell A. York writes that the conversation should be focused on the challenges facing low- and middle income San Diegans. “The problem is that homes are not being built for select socioeconomic groups and that needs to change,” York writes. Our story chronicling the 49th District candidates’ get-out-the-vote efforts misidentified one volunteer as a high school senior; she’s a junior. From Scott Lewis: If you’re not familiar with Reddit, it’s basically a collection of subreddits — categories of the platform where people post their own stories, links to things they find entertaining or images and videos (there are some very not-safe-for-work sections). Then other people either vote them up or down. The links and stories and images with the most votes make it to the top of subreddits. And those can make it to the front page. This recent KUSI live news segment made it to the top of the subreddit called “cringe” Monday. You’ll either think it’s one of the funniest thing you’ve ever seen or your body will reject it and you won’t be able to watch. Enjoy!